Wolfgang Voigt, the Cologne-based co-founder of the Kompakt label empire, is behind Gas, his best-known project. Voigt was a prolific producer of seminal German techno in the 90s under a huge number of aliases, some very well-known including Mike Ink, Blei, Love Inc. and Grungerman, others fleeting or one-off, like Panthel, Riss and Strass. He has released music on a wide range of labels including Warp, Harvest, Raster-Noton and Force Inc. but is probably best known for his ambient project Gas, and as co-founder of the hugely influential minimal house label Kompakt along with Michael Mayer and Jürgen Paape. Voigt was born in Cologne in 1961. On a trip to London with Jörg Burger (The Modernist) in 1988, Voigt was influenced by the acid-house boom which led the pair to found the Trance Atlantic label – a sub of Private Beats Inc – in Belgium where he first released music under the Love Inc alias with 'Do you feel Love' (1991) and the Mike Inc. alias – the Dialogue EP (1991). Many of Voigt’s productions from this early period, including Love Inc.’s Trans Atlantic XS (Rising High Records 1992) and Mike Ink’s Rosenkranz (Sähkö 1994), are considered classics. In 1993, Voigt founded the Profan label, which has been enormously influential both in Germany and internationally and established the foundations of Voigt’s modus operandi in later years. The label was pro-pop ("Bee Gees, not Dokumenta") but maintained a stripped aesthetic in graphics and sound, and released primarily Voigt productions. The aesthetic was developed further with the Profan sub-label, Studio 1. The first instalment of the Studio 1 series appeared in 1995, a set of ten 12" records that comprised a complete sub-label, released over two years. Each colour-coded chapter featured a starkly reduced sound and rhythm palette with a dub reggae influence that set the stage for minimal techno. Under the Love inc. moniker, Voigt produced an album – the first for any of his aliases – in 1996 called Life’s a Gas that used countless samples of everything from the Bee Gees to T.Rex and Queen. It was a technique he transferred to the Gas project, which saw its first release on the Mille Plateaux label the same year. 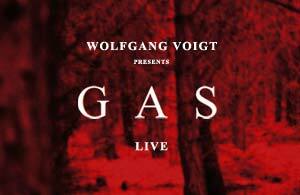 The Gas project, four albums of floating electronic washes, classical samples and muffled kick drum, attracted criticism when first released amid fears that Voigt was promoting nationalism with his choice of samples (though Brückner was Austrian), cover art of forest photographs and titles like Königsforst and Zauberberg. Voigt stressed that he had not intended to promote German nationalism, but was instead attempting to create a genuinely German pop music. In the 00s Voigt was much less visible as a producer, instead focussing his energies on the Kompakt label and distribution company, but re-emerged back into production and the live circuit in 2007. Voigt has produced more than a hundred albums, EPs and remixes since the mid-90s under (approx) twenty pseudonyms. Some of the other better-known examples include: burger/ink (later as Bürger/Voigt), Grungerman (a combination of Schlager samples and minimal techno rhythms) and Freiland (minimal techno series).